Since I have a fairly new puppy, I got to review the Pets+ Dog Training Whistle. It was fairly simple to incorporate it into Barkley's training since he is still young and still keen to learn, since you can't teach an old dog new tricks. The whistle comes complete with a sturdy lanyard so you can hang it around your neck while walking the little guy around the park, allowing you to keep both hands free for holding the leash and scooping poop. 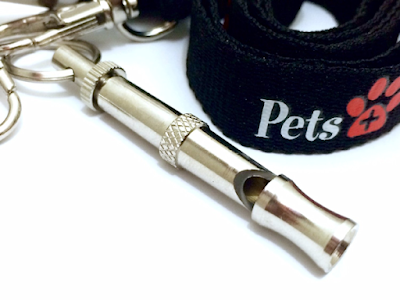 The pitch of the whistle is adjustable so that you can find the sound that works best with your dog by simply twisting the whistle until you get the desired sound, and then tightening the locking nut to hold it in place. The first thing I noticed about the sound of the whistle is that it was a very clean, shrill sound, and that I could hear it. I always thought dog whistles were ultrasonic, beyond the human hearing range, but it seems that I was misinformed. The first blast on the whistle certainly caught Barkley's attention, so I explained to him about how the whistle works, and the code that I had devised for various commands like sit, stay, make breakfast, etcetera and I documented the results in this little photo montage. I felt like Captain von Trapp whistling orders to Maria and his children in the Sound of Music. Overall the whistle is certainly a useful tool, producing a quality sound which is very clear and precise. 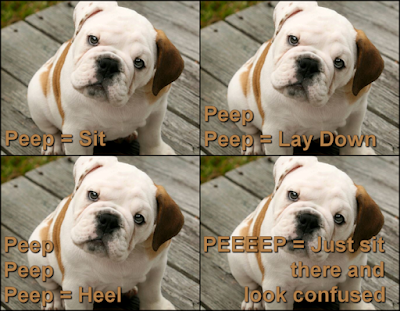 Barkley does respond well to my whistles and is learning the peep code alongside the traditional voice commands. One thing to note, however, is make sure to tighten the locking nut as tight as possible because twice the whistle body did wriggle loose and detach from the adjusting screw. I cannot penalise the quality of the whistle for Barkley's puppyish inexperience, so I am giving it 4/5 while Barkley gets 1/5 for at least looking cute in the pictures.